Samsung CLX-8540ND Color Multifunction Printer - Perfecta Business Services, Inc. The CLX-8540ND. One of the fastest colour Digital MFPs in the marketplace today. 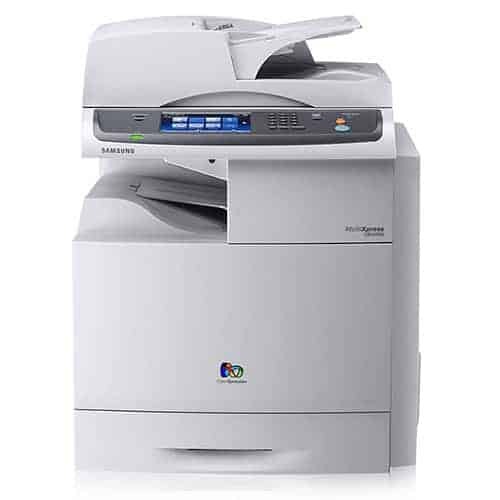 The Samsung MultiXpress CLX-8540ND is the cost-effective way to bring versatile colour printing/copying to any office. Its speed, range of productivity-enhancing features and low total cost of ownership means efficient printing without compromising quality. Combined with Samsung reliability, the MultiXpress CLX-8540ND is designed to be one of the most economical and productive colour laser MFPs not only on the market, but also in your office. Printing 40 pages a minute makes the MultiXpress CLX-8540ND an extremely efficient colour Digital MFP. With a scanning performance of 33 ipm, the MultiXpress CLX-8540ND will get you your documents when you need them. Easy Colour Manager allows you to easily adjust colour balance, brightness, contrast and saturation of any image viewed on your monitor. It can be especially useful if you have specific colour preferences, or if your company has its own brand requirements. You can get an image from anywhere on your screen. You can extend or reduce the size of the preview window. You can adjust the colour tone of the image you grabbed. You can save your toner or paper by selecting the precise area to print. With an 800MHz CPU, 1GB of RAM and a generous 160GB hard drive, the MultiXpress CLX-8540ND makes print and scan jobs easy to process, store and handle. The added features and processing power mean it’s suitable for the most demanding office environments. The MultiXpress CLX-8540ND provides users with an Auto option. Users no longer have to rely on manually differentiating between mono and colour prints. Users can skip the time-consuming process of separating mono and colour documents while saving money by avoiding the cost of unnecessary colour prints. You can print, scan and even fax (optional) through your IT network in minutes, without slowing you down. And with one highly capable device taking care of the needs of even large workgroups and departments, the only thing you’ll notice is productivity increasing. Real-Time Calibration Technology ensures documents are printed to a consistently high colour quality. When printing especially important documents, users can still choose to manually define the colour quality of their documents. The MultiXpress CLX-8540ND handles the demands of premium-quality prints with ease. The Easy Colour Manager and enhanced CTD sensor ensure colour output is always clear, sharp and professional.